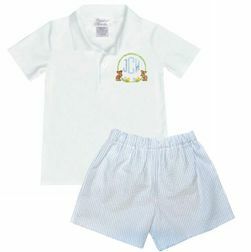 Boy's Bunny Rabbit Shirt-Monogram Easter Bunny Polo Shirt for Infant and Toddler Boys-White Polo Shirt with Easter Rabbit and Easter Eggs. 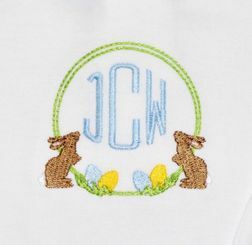 We just love this bunnies and eggs circle monogram! 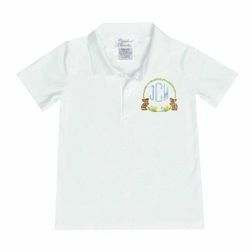 We take a soft, white polo shirt and monogram the left side (where a pocket would be) with a lime green circle embellished with brown bunnies and pastel Easter eggs and your little one's initials in blue to match the eggs. 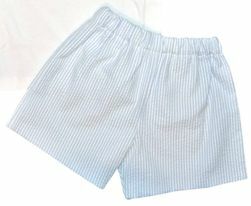 You can choose to pair the polo shirt with our sweet light blue stripe seersucker shorts or pants for an adorable Easter Egg hunt or school Easter party outfit.